The non-profit Advocates for Highway and Auto Safety have released the findings of a study that shows the best and worst worst states for driving safety. The study used a combination of National Highway Traffic Safety Administration (NHTSA) data and an examination of current safety laws being enforced in each state to determine which states were making an effort to protect their citizens as well as which states were being effective in doing so. 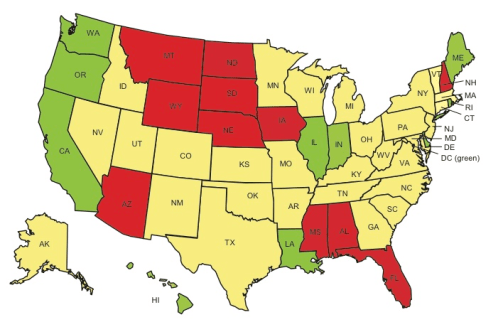 The study revealed 10 states to be highly effective in taking active steps to improve driving safety within their borders, as well as 11 states which are in dire need of improvement. There doesn’t appear to be a lot in common among the states that rank as the safest. We’ll list them out first and then we will explain what’s so interesting about their data. What Makes These States the Safest? The report, which was organized by the Advocates for Highway and Auto Safety (AHAS), rates these states on the amount and types of laws each state has enacted to protect drivers. This includes laws regarding safety devices such as seatbelts and child restraints, as well as laws regulating driving while intoxicated, distracted driving, and laws governing young drivers. The states that ranked in the top ten were found to be doing the most for drivers in their state in terms of ensuring their safety via lawmaking and law enforcement. This data alone might not have been very useful, but the study then took that data and was able to correlate it to the number of vehicle-related deaths in each state. The results were surprising. Do More Laws Make You Safer? There’s a lot to argue when it comes to lawmaking, but this study has shown that the states who have adopted or enacted comprehensive laws that address specific risks related to drivers were able to reduce the number of deaths related to the laws which they have enacted. That might sound a little confusing so here’s an example. Let’s say a state enacted a law that banned drivers under the age of 19 from driving after dark. That state would then see a significantly reduced number of vehicle accidents (specifically deaths) related to teens driving after dark. The study helps make the case for enacting comprehensive laws as a response to public safety issues. One thing that caught our eye was that Louisiana was listed among the safest states. This is particularly interesting because Louisiana drivers pay more for car insurance, largely due to the fact that within their state there are a very high number of car insurance claims. It’s possible that fraud plays a role, but looking at the data it appears as though Louisiana drivers are more likely to be involved in a traffic accident. It seems that might imply that Louisiana doesn’t deserve to be on the list, but the data is based on the number of vehicle related deaths—not accidents. So in the case of Louisiana, you’re not likely to die in a car crash, but there’s a good chance you’ll get into a fender-bender. For that reason, we’d like to see a study that takes into account the number of incidents, regardless of whether or not there was a death. We think this could really impact the rankings and deliver more meaningful numbers. We were surprised by how little some states were doing to protect their citizens. New Hampshire has no law enforcing the use of seatbelts. South Dakota only had 2 driver safety laws: one prohibiting teens with learner’s permits from driving after dark and the other forbids driving with an open container. It seems that there is more these states could be doing to protect their citizens from vehicle-related deaths. Of course, it’s possible that the citizens of these states don’t want such laws enacted. What Driving Laws Were They Looking For? The group that conducted the study (AHAS) was looking for each state to have certain laws in place that target safety measures for drivers. There were 15 types of laws in total. Examples of these driving laws include anti-texting while driving laws, increased minimum age for learner’s permits, and laws requiring the use of safety restraints for adults and children. Safety is one of the most important aspects of a car. We’ve written a number of car safety guides to help you stay informed and brush up on some not-so-common driving knowledge. The safer you are, the less you pay.Read through the car safety guides below for tips on how to be the safest you can be in your car and on the road. Even if you’re a good driver, a little extra info can keep you that much safer.